Since September 29, 2011 we have had eighteen deaths related to Crooked Tree Village with thirteen of them interred in the village. In a village of roughly 1400 people that’s quite a number for the last few months. Not only is the number alarming, but burying them is now becoming a problem. 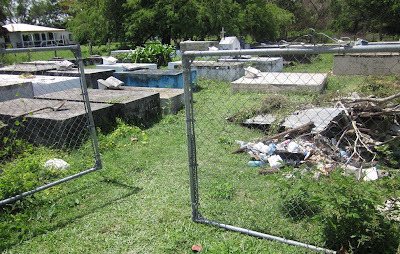 The cemetery is small; it was established by the Baptist Mission Church in the early 1920’s. This plot of land next to the Crooked Tree Baptist Church was originally set aside to honor our loved ones for generations to come. Since then the village has grown to more than triple its size and the cemetery is now very overcrowded. It has now become common place to bury the dead on top of dead relatives and sometimes even with strangers. It is so bad that a few families are now burying their dead in their backyards. But many of the villagers are not willing to bury their dead in their back yards for fear of dealing with the entire village becoming a graveyard. Dying in Crooked Tree Village is now a crisis. In the past twelve years the practice of digging up old remains and reburying them with new corpses on top is common. Some people think this recycling practice is lacking in showing respect for the dead. A villager recently told me that if they want to disturbed her mom’s grave “I will stop anyone from doing so. No way, as long as I’m living, no way”! Crooked Tree recently got running water to every household and this water is coming from underground water supplies. A poorly placed grave on private property or at the cemetery could run the risk of contaminating the water with decomposing corpses. And to add insult to the dead, the cemetery has been riddled with overgrown shrubs, broken headstones, fallen trees and some of the graves in very poor condition. Most of the time the cemetery is cleaned only when someone will be buried and it’s usually just around the area where the body will be interred. In the rainy season of November 2008 the village suffered a terrible flooding and the cemetery was badly damaged after the water receded. 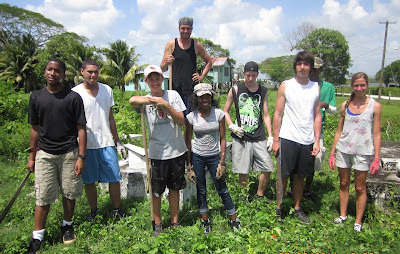 The Crooked Tree Village Reunion set up a fund raising effort to help the village. 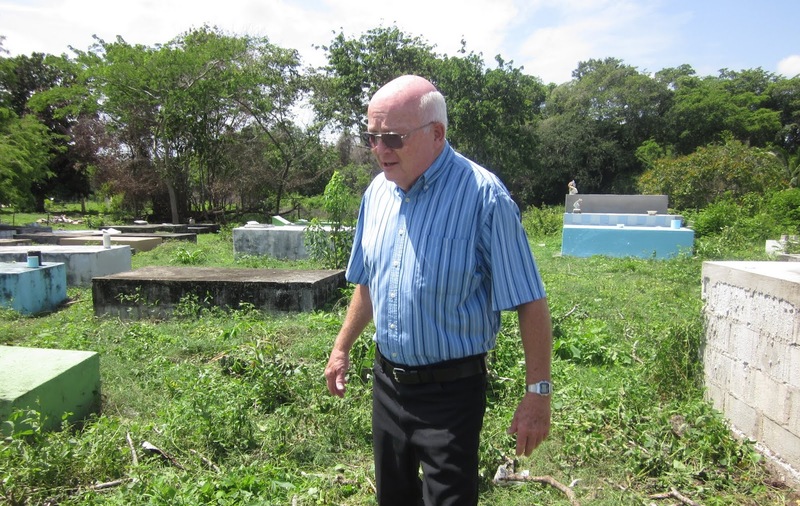 The reunion committee raised a total of BZ$4350.00 and designated the funds for the clean-up and refurbishing of the cemetery. Allowance was also made for a new sign to be installed above the gate. 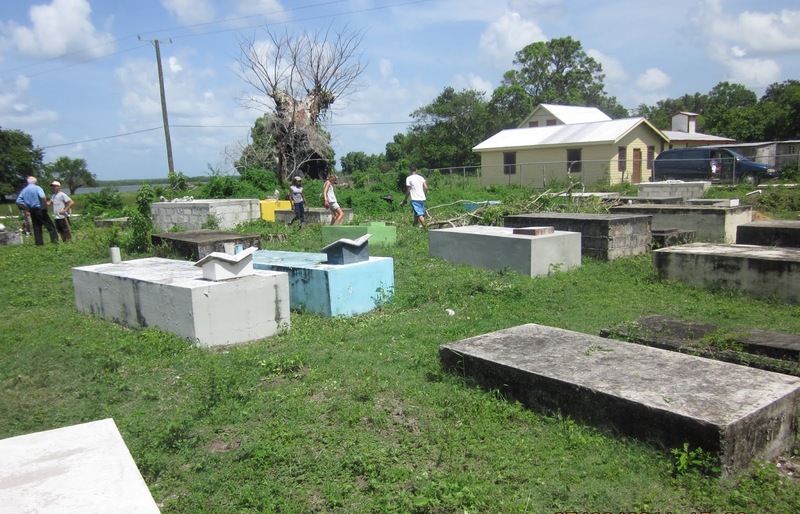 A letter and the checks stating the designation of the funds were turned over to the Crooked Tree Village Council and deposited in their bank account and up to this day nothing has been done to repair the cemetery. Last summer a group of high school volunteers from the Learning Institute in USA were hard at work cleaning up the cemetery in Crooked Tree Village. 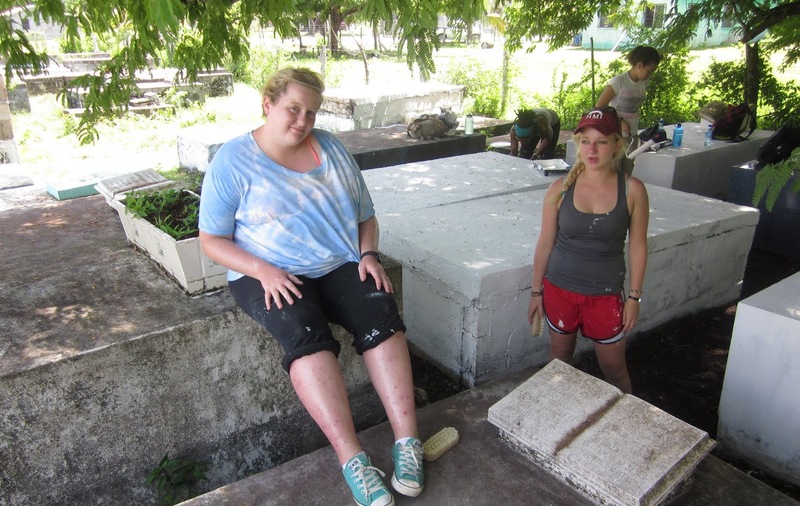 Even though it was a hot and humid day the volunteers were all in place raking leaves, clearing brush and debris, re-plastering broken graves and painting unattended graves. 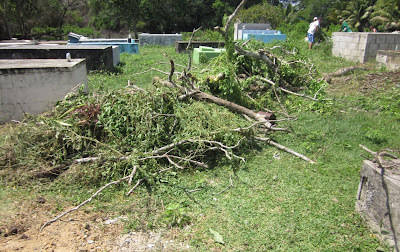 The graves and grave yard were maintained with the utmost respect. The village needs a new cemetery and unless land is made available they will continue to unearth unmarked burial spots. And finding the ideal space for a new cemetery will be a huge problem; there is plenty of lease hold land with absolutely no development, but who will be willing to give up their land for the dead will be a mystery. I call upon the Ministry of the Environment to allocate a parcel of land for a new cemetery because the Crooked Tree Village Council seems to be in no hurry to find a burial place for its departed residents. The death rate is increasing due to population growth and the only option available now is the continuation of double-decker graves. Below is the letter sent to the Crooked Tree Village Council regarding the donation for the upgrade and clean-up for the cemetery. 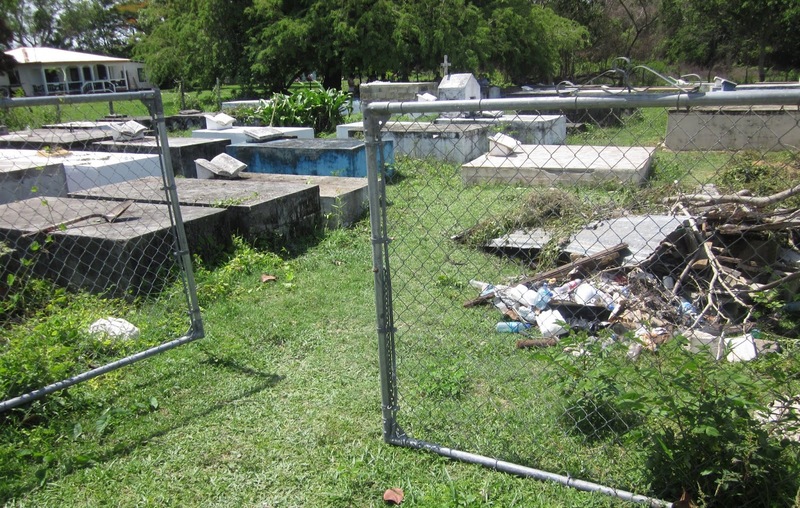 Up until today, June 13, 2012 nothing has been done to upgrade the cemetery. As you and the Officers of the Crooked Tree Village Council are aware, the Crooked Tree Village Reunion Foundation had initiated and participated in a fund raising effort to assist our Village in the time of a flooding crisis. On October 20, 2008 we were deeply distressed to learn that Crooked Tree was seriously impacted by a flooding condition which was caused by a tropical depression. 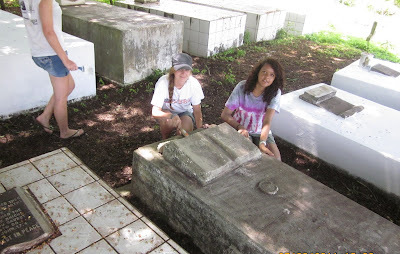 A) Clean and remove the water stained marks on the graves and repaint all the graves. We will suggest that the Village Council make a selection of about three or four colors. 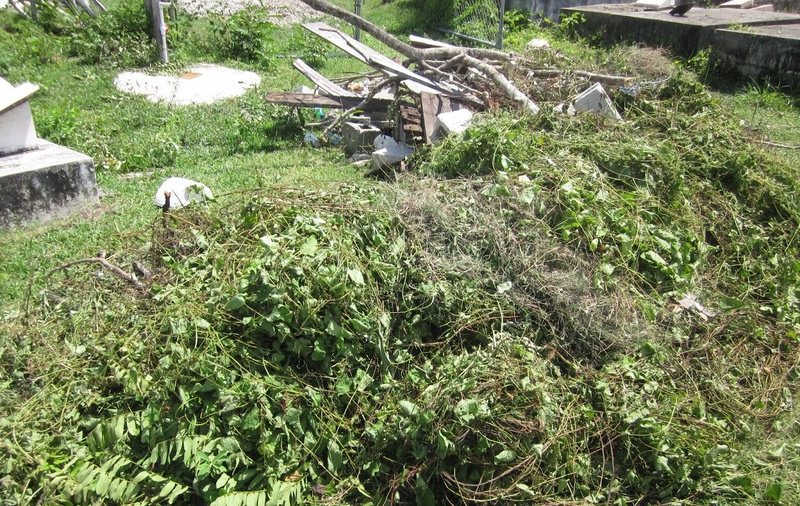 B) Clean-up the Burial Ground and remove all the debris and remove unwanted weeds. C) Plant some flowers to improve the appearance of the Burial Ground. D) Install a gate at the main entrance and install a sign over the gate to mark “The Crooked Tree Village Burial Ground”. E) At the completion of the Burial Ground project, we will suggest that any remaining funds be used to install a gate at the Crooked Tree Health Center. We realize that this is a major undertaking but with the funds in hand this project should be much easier. We would appreciate you providing us with a short outline of how and when this project will go forward. We were discussing that perhaps we should work on the graves when the hurricane and wet weather season is over. Please give us your feedback. We are required to be transparent to our donors on how the funds will be used in this project: therefore we are asking you to provide us with a summary of how the funds will be used. Linda, reading your blog today makes me very sad and upset. 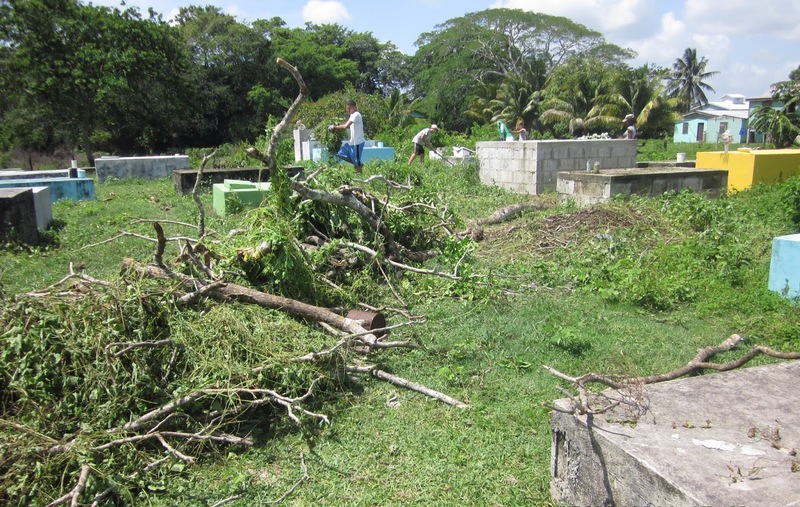 I couldn't even finish it all at once because it's so upsetting to see our burial grounds look so shabby and dirty and our villagers do not take the time to clean up and make it look respectable and appreciated. Just the same how we don't have a darn police station in our village. We as villagers should come together and support somebody like you who is interested in doing something for our village and stop judging and criticizing. I'm so sick of all this nonsense;not even a frikkin police station we have in our village. How much worse can it get! ?